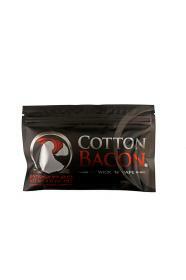 Wick 'N' Vape have set the standard for the best cotton to use in any rebuildable device. Widely considered amongst the vaping community as the best cotton to use, Bacon Cotton V2 is the cleanest tasting cotton for an enhanced, superior flavour. Itt requires no 'break-in' time and is more absorbant than V1 whilst maintaining flavour across a broad scope of heat temperatures. Each bag contains 10 pieces of quality certified, 100% medical grade cotton and is free from any pesticides or chemicals.